This workbook is designed to help students studying for the Fce (First Certificate Examination). This University of Cambridge exam is taken by over 250,000 people worldwide every year and is one of the most popular English Language Teaching (Elt) exams. It includes a range of activities to help students build and improve their English vocabulary, and it is suitable for both self-study and classroom use. Rawdon Wyatt is the author of numerous other vocabulary preparation books, including ones for the International English Language Testing System (IELTS), the Test of English for International Communication (TOEIC) and the Test of English as a Foreign Language (TOEFL) exams. This book has been written for students who are planning to take the Cambridge First Certificate in English (the FCE) and who want to develop their vocabulary for the exam. 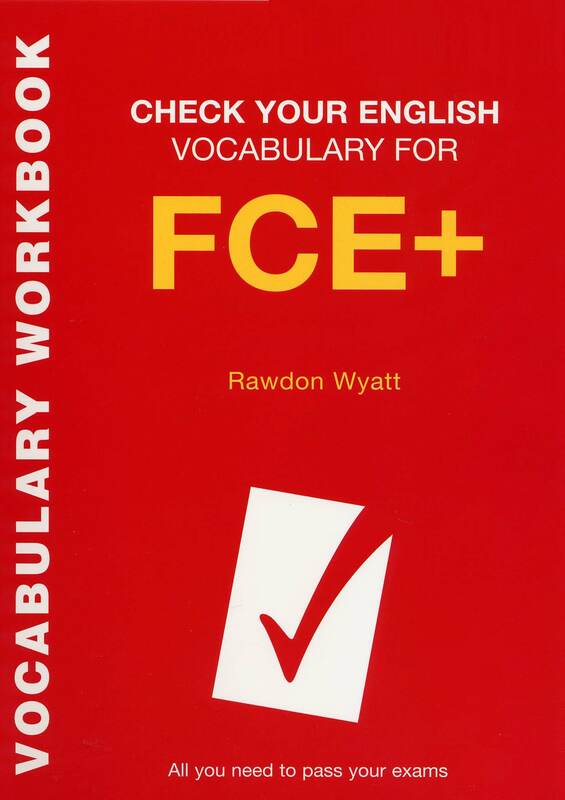 Why is the book called ‘Check your vocabulary: FCE +? It is also ideal for students who are going to take the Certificate in Advanced English (the CAE) within the next 6 – 12 months and would like to review / reinforce their vocabulary. Furthermore, unlike other FCE vocabulary resources, it also looks at some of the ‘real’ English that native speakers use in their everyday lives – idioms, colloquialisms, slang expressions and so on. Non-exam students at an intermediate or upper-intermediate level will also find the book ideal for developing their vocabulary. Part 1 focuses on general vocabulary items that would be useful in the exam as a whole (for example, word forms, phrasal verbs, prepositions, language of contrast, and uses of common verbs such as make and do). Part 2 focuses on common topics that often come up in the FCE exam and which students might need to speak or write about (for example, the environment, money, shopping and relationships). There is a complete answer key at the back. Remember that you should keep a record of new words and expressions that you learn, and review these from time to time so that they become an active part of your vocabulary. Some students keep a notebook or file specifically for this purpose. Also remember that there are other methods of acquiring new vocabulary. For example, you should read as much as possible from a different variety of authentic reading materials (books, newspapers, magazines, etc). To help you learn English, you should use an English dictionary that can clearly define words, provide information about grammar and give sample sentences to show how words are used in context. You can use any good English learner’s dictionary with this workbook. Many of the sample sentences in the book have been taken or adapted from the Easier English Dictionary for Students.